After a lifetime of being locked up, rescued moon bear Bao Lam savours chance to play, eat delicious treats and even sleep in peace as she makes up for lost years. When rescuers found Bao Lam more than a year ago at the Dambri Resort in central Vietnam, she was curled up in a corner of a dingy shed, plagued with arthritis in her legs, cataracts in both eyes, rotten teeth that caused her constant pain, and signs of chronic high blood pressure. For a middle-aged bear, her ailments made her seem very old. 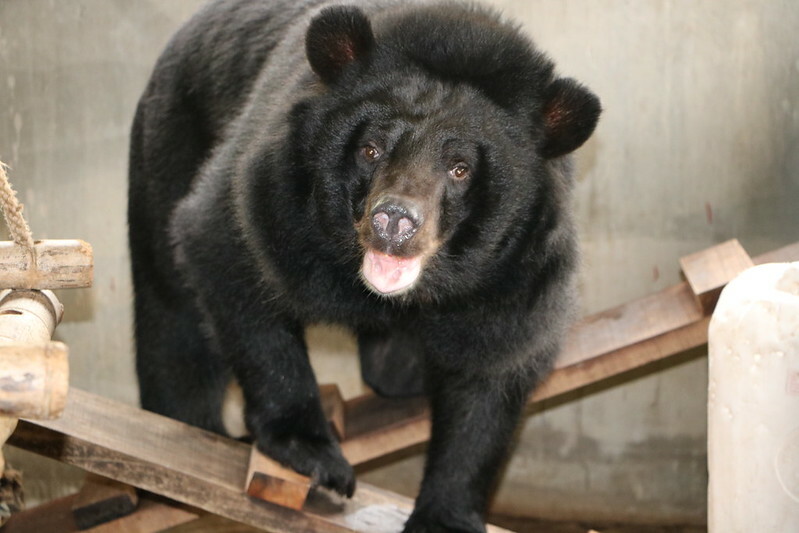 Bao Lam was one of 11 bears bought by the resort, which had planned to open a zoo and a circus featuring one of the oldest and cruellest forms of entertainment, dancing bears. But when the plans were abandoned, so were the bears, to a forgotten corner of the lush resort where they were caged in horrifying conditions. One by one they started dying from disease, starvation and neglect until Bao Lam was the only bear left. When a rescue team from Animals Asia arrived in August 2016, no one could say how long Bao Lam had languished on her own. After arriving at Animals Asia’s sanctuary 1,500 km away, the vets immediately removed Bao Lam’s broken and infected canine teeth, and prescribed medication to tackle her high blood pressure - known as hypertension. To make her feel comfortable and at home, Bao Lam’s carers found her plenty of fresh banana leaves for nesting with and lots of sweet watermelon slices to snack on. With kind and gentle encouragement, Bao Lam has quickly revealed her playful nature and a curiosity to experience all that she had been denied until now, including the joy of splashing water around. She also takes enormous pleasure in being active, rolling around on her back, balancing leaves on her paws in mid air, chewing logs and shredding dried palm leaves. The weeks and months have seen Bao Lam’s physical health improve considerably. The ability to roam around the largest space she has ever known, taking in the fresh mountain air, has allowed Bao Lam to build up her strength and coordination which were severely depleted in captivity. With a spring in her step, Bao Lam now happily climbs in and out of baskets in her sleeping area, or explores the bamboo structures, pools and trees of her grassy enclosure. She also loves to sit and relax in the middle of a tractor tyre - her favourite spot. Friendship is also a new feature in Bao Lam’s life. Once she had grown accustomed to her new surroundings, Bao Lam was introduced to her new playmates. At first she did not take kindly to being playfully wrestled by Cinta, one of our friendliest bears, and she was wary of Oscar, a male bear with a solitary streak. 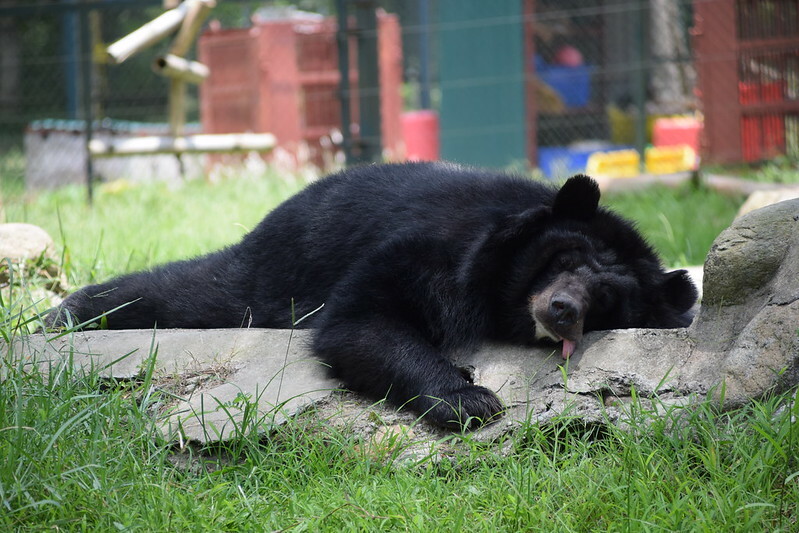 But after spending time with Cinta, Oscar and other rescued bears Bao Lam has become much more relaxed. She is now especially good friends with Sindy, who she often shares a den with. It won’t be long before they are a proper gang. “Bao Lam has the softest of eyes and an endearing habit of pinning her ears back against her head when offered treats, which makes her even more adorable. Despite her various ailments, she has shown a great appetite for life, playing, exploring, foraging and doing things happy bears do. To date, Animals Asia has rescued over 600 bears – mostly from the bear bile industry – with around 270 bears continuing to live out their lives at sanctuaries in Vietnam and China.